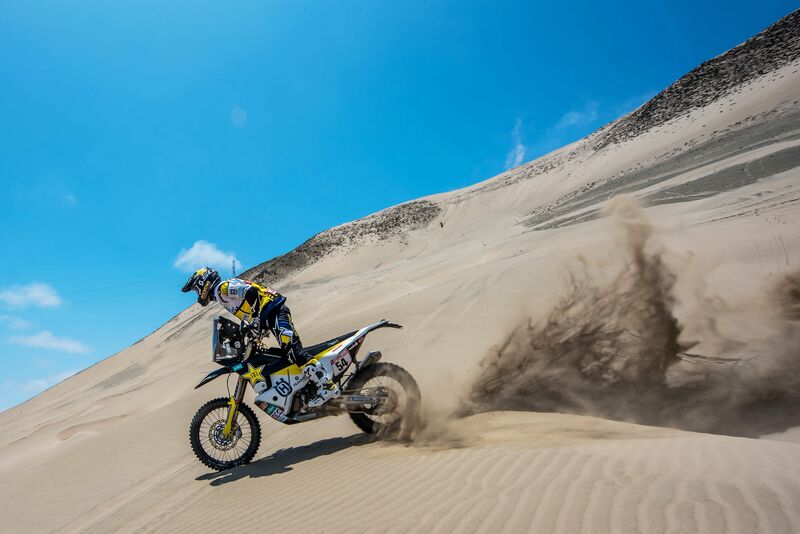 Making light work of the 2018 Dakar Rally’s first long special stage, Rockstar Energy Husqvarna Factory Racing rider Pablo Quintanilla claimed a solid sixth place result. Two stages into this year’s event and the Chilean rally star is currently placed fifth overall, less than six minutes behind the provisional class leader. Everything went to plan for Pablo in the dunes of Peru. Putting in another solid performance in Sunday’s stage two, the Rockstar Energy Husqvarna Factory Racing rider brought his FR 450 Rally machine home inside the top six for the second consecutive day. Enjoying a good feeling on his bike, Pablo is looking forward to tomorrow’s even longer stage. Making some good progress and continuing his apprenticeship in rally racing, Dakar Rally rookie Andrew Short wrapped up the stage in 25th position. Currently 25th overall, the acclaimed US racer remains focused towards his major goal of reaching the finish line in Córdoba. Stage three of the 2018 Dakar Rally include hundreds of racing kilometres in the massive sandy dunes of Peru. Starting the stage early tomorrow morning, competitors will contest a timed special of 296km in a total distance of 501km towards the finish in San Juan de Marcona.